Sound is created when something vibrates. The vibrations are energy and energy can be transferred from one object to another. The energy from the vibrations transfers into the air and the air, in turn vibrates until it reaches your ear. Your eardrum then vibrates, causing other structures in your ear to vibrate. All of this, in turn, stimulates nerves that send impulses to your brain which translates it all into how we understand sound. Sounds complicated, and in the details it is beautifully complicated. But, at the heart of it all, sound is vibrations. Let’s create a visualizer to help see the vibrations as they travel through the air. Strip about ½” – 1″ from the lead wires on the speaker. Note which wire on the speaker is the ground (-) and put a piece of tape on it to help identify it easier as you continue. Strip back about 1½” of the outer insulation, exposing the interior wires. If you have a mono cable, you will see two wires (go to #7) or a bunch of bare wires and an insulated wire (go to #10). Connect the ground (-) wire (usually black) to the ground on the speaker by twisting the two wires together or soldering them together (if you know how). Wrap in electrical tape to insulate. Repeat with the second wire to the other speaker lead. If you see a bunch of bare wires, twist them all together. That is the ground. Connect the wires to the ground lead on the speaker by twisting the two wires together or soldering them together (if you know how). Wrap in electrical tape to insulate. Strip the second wire back about ½” – 1″ and connect it to the other speaker lead. If you are using a stereo jack, you’ll see two insulated wire and a bunch of bare wires. Tape one of the insulated wires out of the way. Then do instructions #10-12. Add some more tape to the connection between the speaker and the audio jack to make sure they can’t get accidentally pulled apart. Test your speaker by hooking the audio jack up to your computer or smartphone and playing some tones around 500Hz. If you don’t hear anything, you may have a bad connection or the wires crossed. Cut a hole in the bottom of the cup using the scissors or Dremel tool. Make it just slightly smaller than the speaker. Stretch the round part of the balloon over the top of the cup so it is on tight. It helps to have someone hold the cup while you do this. Tape or glue the speaker to the bottom of the cup. Flip the cup so the balloon is on top and the speaker is on the bottom. 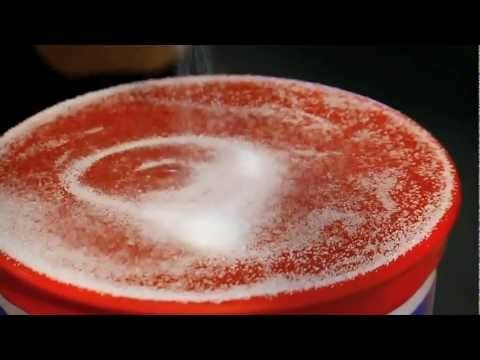 Pour salt on top of the balloon. Connect the speaker to the tone generator. I recommend starting with tones in the 500Hz range and then change the values. Watch what happens with the salt. If you don’t see the salt bouncing, no matter the setting, try turning up the volume. As I said at the top of this entry, sound is vibrations. But each sound has its own unique vibrations. A tone generator picks one specific tone at a time and creates that specific type of vibration. The vibrations from the speaker pass into the air and then into the balloon making it vibrate. The vibrations from the balloon make the salt bounce up and down on top of the balloon. Different tones create different vibrations which causes the salt to bounce in different patterns. Some tones won’t create patterns. Even though you can hear it, the vibrations don’t translate as well into the balloon, so the salt won’t dance around like it does at other tones. This could be due to the speaker or the size of the cup. The air and everything is still vibrating, just not in the way needed to make the salt dance.